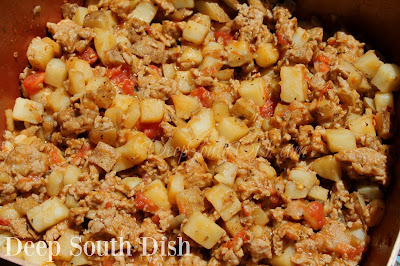 Sausage and Garlic Potatoes - skillet fried potatoes, cooked with Italian, breakfast or turkey sausage, plenty of garlic and fresh or canned tomatoes. Okay, right up front, I reckon this isn't the prettiest picture, and I'm sure, due to the nature of the internet, somebody is gonna feel free to let me know that. Truth is though, you and I know that a lot of the best tasting foods aren't necessarily the most photogenic. As a person with a blog of recipes, some are a little difficult to "style." Have you seen my mandarin orange fruit salad, aka to many of you as ambrosia salad? There is no way to make that dish look good, but man is it delicious! I've already told y'all what I think about all that photography business anyway. I'm just more about the food around here! Heck, I didn't even take this one out of the skillet I cooked it in. Anyway, I can tell you that this is a super easy, hardy skillet meal that tastes very good, and I've sure been all about those kinds of meals this summer. This time I used some turkey sausage I found up in the deep freeze, but breakfast sausage, Italian sausage and bratwurst will work great too. You can even substitute ground beef or turkey if you prefer, just remember to taste and adjust for seasonings, since they won't have the extra seasonings the others sausages have. I also like a good bit of garlic in this dish, but if you aren't the biggest fan, feel free to adjust as needed. For more of my favorite skillet meals, visit my page on Pinterest! Heat oil over medium in a deep lidded skillet. Add potatoes, onion and garlic; season to taste with salt, pepper and Creole/Cajun seasoning and toss to coat with oil. Cover skillet and steam cook over medium for 5 minutes covered, without stirring. Break up sausage and add to skillet, cooking 5 minutes longer, or until cooked through and no longer pink; do not drain. Add Italian seasoning, tomatoes with their juices and sugar. Reduce to medium low and continue cooking until juices reduce, about 5 minutes longer, stirring to prevent sticking. Taste and adjust seasonings. Serve with hot bread and a nice mixed garden salad or green vegetable. Cook's Notes: May substitute 1 (14-1/2 ounce) can diced tomatoes, undrained. Omit sugar. Sausage and Potatoes with Eggs: Prepare as above in an oven safe skillet. Using a spoon, make 4 wells in the potatoes, crack one egg into each well and sprinkle the eggs with salt and pepper. Transfer skillet to a preheated 325 degree F oven, for about 10 to 15 minutes, or until yolk is set as desired. Sprinkle with shredded cheese, if desired, and return to the oven just until cheese is melted. Check These Skillet Recipes Out Too Y’all! Now this is my kind of meal. Meat and potatoes with only one pot to wash. I have a package of Johnsonville brats I was going to grill over the weekend, but I believe you have changed my plan. Some cucumbers and sour crème on the side, this sounds really good. Thanks Richard! I hope that you enjoy it. Made this for dinner tonight and it made a quick, easy and hearty meal. I did add some green and red bell pepper. For color and to use some up; the garden is in full harvest mode. Two hour from on the vine vegetables, are hard to beat. Besides potatoes, onion and bell peppers go so well together. This dish passed the smiling wife test and that is a winner. Thank you Ma'am. Thanks Richard! Glad y'all enjoyed it. I like the peppers too. Now, tell me the secret to get my husband to cook for me?? My bride of 37 years, is a Senior RN working in the Neonatal Intensive Care unit of our hospital. She works 12 hours days 3 days a week. After a long shift she is tired and hungry. She has been through long deployments overseas, many a hunting, fishing and golf trips. Given me two beautiful daughter and generally put up with me for nearly 40 years. The least I can do is cook a simple dinner for when she gets off work. Which is why I enjoy this site. I'm not a skilled cook. Your simple, clear instructions make it easy for a kitchen rookie like me to made a decent meal. Thanks so much Richard! I tease my husband about not cooking and he's tried on occasion when I worked out of the house, but doesn't enjoy it and will tell you he's not very good at it. He's a pretty good fella otherwise though! :) The world could use a few more gentlemen like you and him in this world today I tell ya! Really looks good! Sometimes I add cabbage to it too. Wasn't sure what was for dinner, but I think I'm making this tonight. Mmmmm..mmmm, yes indeed! I make a similar cabbage and potatoes dish myself, but I like to use andouille sausage with that one. Unfortunately my husband isn't a fan of cabbage like I am, but he'll sure devour this dish! You're welcome Sherry & so happy to hear y'all enjoyed it! This is my kind of book!! Fingers are crossed! Dad always said if his wife and cook would not go somewhere, he didn't need to. Only thing he could cook was oatmeal for us kids on Sundays, so Mom could get gussied up for church. In the last 3 years of their lives, he did almost all the cooking, and darned if he didn't get better at it. He was still a horrible cook, but he'd discovered Jiffy corn muffin mix, biscuit mix, instant rice and mashed potatoes, and frozen convenience meals. The recipes from this website, from his beloved Mississippi (he had jet black curly hair, was from 20 miles north of Tupelo, and Presley was his middle name LOL), really helped them out and I got big kudos for cooking them. Thank you so much again for this website. Aw Bonita! You made me cry!! HUGS!! I suffer from a sensitive stomach. While I would love to sit down and eat this, my guts tell me no. What can I change so that I can enjoy this dish and many other that ask for onions.